Some years ago, the stud expanded to include a few large Shetlands to produce active ponies suitable for riding or driving. We acquired Kirkbride Guardian 2211, an elderly grey stallion who was also genetically palomino, dun and roan. He had a wonderful temperament, which he passed to his foals. At the age of 31 years, he left us with a number of daughters in a variety of colours and shades, including some purchased from the Hasguard Stud. 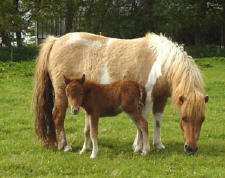 We now have a strain of large standard cream and palomino Shetlands that are proving ideal as childrens riding ponies. The palomino colouring in this line traces to Nola of Manar, born in 1922, the same source as many of the renowned Littlestoke ponies. We also have duns and roans from Guardian. Christmas Rose of Tormore has proved to be an excellent dam of good riding ponies. 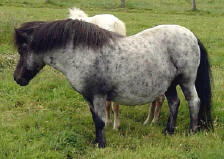 One of her sons is the mouse dun roan gelding, Christmas Rose's Revoan, by Kirkbride Guardian, who did particularly well in Performance classes before being exported to Germany. Rose is also the dam of Kellas Chromite who, as an unbroken 5 year old gelding, made 680 guineas (£714) at the Thainstone Pedigree Shetland Pony Sale in 2006 . Christmas Rose's blue roan daughter, Rose's Petal, also by Kirkbride Guardian, was retained here as a brood mare until she went to Mrs. Nikki Wellman. Petal is micro chipped & DNA identified. Another of our full-sized mares is Truffle of Hasguard, a palomino dun, who is producing promising up to height young stock. Truffle is micro chipped & DNA identified. 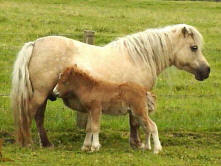 Truffle of Hasguard with foal, Kellas Tequila Gold, who turned palomino & is by Clibberswick Hammerite. Scamells Rosette, a big chestnut dun mare has been used as a children's riding pony. Her chestnut dun & white daughter, Kellas Rosetta, was retained as a brood mare. Scamells Rosette with her chestnut colt foal by Clibberswick Hammerite. 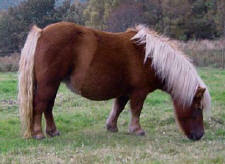 Rosette was 3rd in the Shetland Pony Stud-Book Society Mare Rating Scheme 2003. Kellas Rosetta, a daughter of Scamells Rosette, is proving to be most caring mother even stealing a 2nd foal & suckling it with her own, one foal on each side of her. Ramparts Octarine is a beautiful big mare whose 1st two foals were sold as potential driving ponies. She has a wonderful temperament which is passed to her foals. Octa is currently on loan to the Abbotsbury Stud. As with our miniature Shetlands, we microchip and DNA identify our best young mares.